The team at BlackOut Design is excited to announce its recent success at the American Advertising Awards by the Northeastern Pennsylvania American Advertising Federation! We won a Silver Addy for the Johnson College outdoor campaign. When it came time to launch a new outdoor campaign for Johnson, we took a modern approach to the design. Using creative plays on words paired with a bold design, we were able to deliver a look as forward-thinking as the college itself. 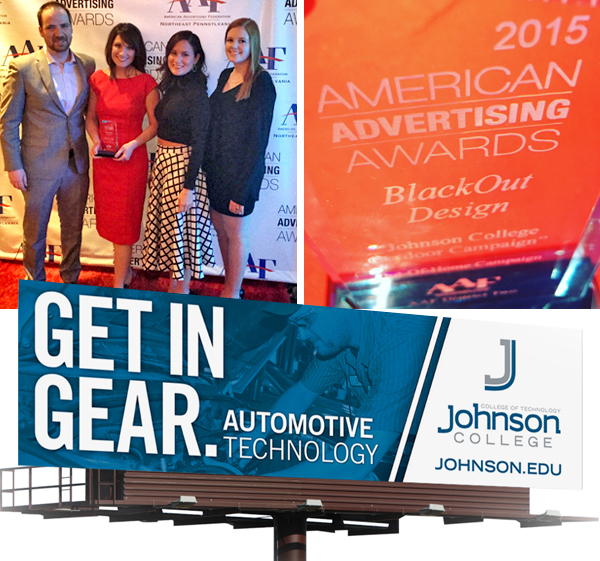 The team at BlackOut Design, working alongside Sweda Advertising, has been working with Johnson College since 2009. Over those last 7 years, we’ve aided them in achieving success and building their brand. For the 2015-2016 school year, Johnson welcomed a record number of freshman students and our goal is for the momentum to continue!